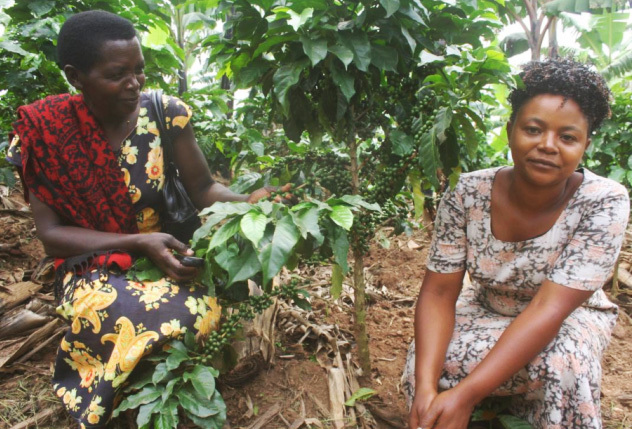 In the mountains of Bunyaruguru and Katerera in Western Uganda, a region renowned for its stunning emerald green crater lakes, Robusta farmers and Arabica farmers have come together to form Ankole Coffee Producers’ Co-operative Union. ACPCU’s members are from multi-ethnic distinct communities with different languages, but they are all working together with the aim of improving prospects for their families and communities. ACPCU’s farmers work hard to nurture their land and keenly attend training sessions to learn more from planting through to post harvest. They have planted shade trees, including banana and yam and ground cover from beans; all of which help to improve the family diet. Farmers use cow manure and banana leaf compost to fertilise the coffee. Pests are treating using extract from the Bird’s Eye pepper plant, which grows amongst the coffee. They do not plant coffee on very steep hills to reduce the risk of landslides. Farmers grow Arabica coffee on the slopes of the Bunyaruguru mountains, overlooking the Queen Elizabeth National Park and forty sparkling crater lakes. In 2012, farmers jointly invested in building micro-coffee washing stations to transform the quality of their coffee and in 2015, ACPCU is building large central washing stations to meet the increasing demand. Previously, farmers were powerless in the coffee supply chain and there was little incentive to invest in quality. This has all changed now they are organised and members of ACPCU. Thanks to the Fairtrade premium, ACPCU’s farmers have been able to invest in their local communities and the co-operative. They have renovated local primary schools, and built a community centre and library. To improve quality and production, ACPCU has invested in central processing facilities which include a mill, hulling and sorting and a large coffee seedling nursery, from where young plants are distributed to members.